Know Code or No Code! The choice is yours. Recently, over the past 12 months, there has been a lot of hype about Chatbots. Facebook Messenger announced the launch of their Messenger Platform with Chatbots in April 2016. This effectively allows businesses to deliver automated customer support, e-commerce guidance, content and interactive experiences through chatbots. A Facebook Messenger Chatbot for your business could boost loyalty and provide an additional contact stream for your valuable customers. Recently at the F8 Facebook Conference 2017, David Marcus announced the launch of Messenger 2.0 with added features including Chatbot Extensions which further enhances the capabilities of messenger Chatbots. I am not going into why you should consider a Chatbot in this article. You may read about that in a previous article about The Point of Difference between an App and a Chatbot. This article will cover the options and how to go about implementing a Chatbot for your business. Consider Which Messenger Platform is right for you? Facebook Messenger or Messenger for short, is by no means the first to enter into the Chatbot space. 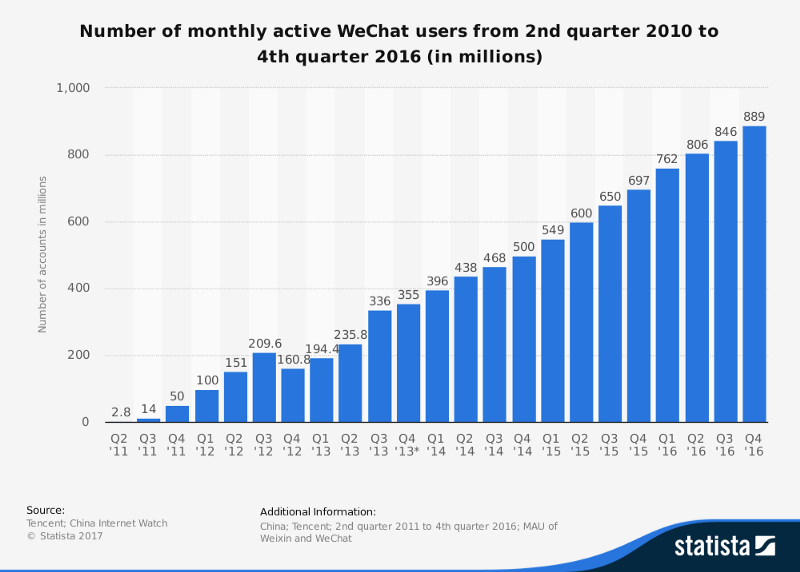 The first is actually WeChat in China with a userbase of close to 900 million active monthly users. Other common Chat Applications that have implemented Chatbots are competitors like Kik, Line, Weibo, Slack, Skype and Telegram. It is important when researching for the development of a Chatbot that you consider whether you would like to “build once” and deploy to various Messenger Platforms or target a specific user base. With 1.2 billion monthly active users on Messenger, just deploying to Messenger alone may serve it’s purpose, however it may be prudent to choose a development environment where quick implementation over to another messaging platform may be easily accomplished. My experience leads me to categorising the “build it yourself”, no code development platforms into two categories which I would label as Facebook Messenger Specific and Optional Messenger Platforms. These platforms have limited functionality with regard to providing solutions for complex applications such as integrating with third party vendors or enabling handover of the chat from the bot to a human agent for example. I guess because they focus just on Facebook messenger they are well placed to provide better tools with regard to remarketing and engaging customers. ManyChat is superb at this and got mentioned at the F8 Conference in April 2017. If you are a digital marker, check them out. These development platforms typically suit chatbots designed for small business or personal pages. If it is just a generic chatbot to interact and respond with your users then these are my recommendations. I have categorised some Development Platforms as Optional. This is a little ambiguous . Most allow deployment to a couple of different Messenger Platforms however require individual chatbot development or duplication. Flowxo on the other hand are unique, to the best of my knowledge, and offer a “build it once, deploy on many Platforms” feature with no duplication required. They are also the “only platform with over 100 integrations”. Very powerful for utility type chatbots. I am not affiliated with Flowxo but I will disclose that after extensive research I have chosen Flowxo as my prefered development platform for when a client has not specified a Development platform of their own choice. Flow XO was designed from the start to be multiplatform and we work hard to ensure that everything is made as standardised as possible across all platforms without requiring the user to duplicate their own time and effort in building bots. —Karen Barker, Flowxo. So if building it yourself is “not your cup of tea” then consider outsourcing. Some of the development platforms such as Chatfuel keep a network of Chatfuel Official Partners that offer a service. There is a specialised Chatbot development site called Botgig where you can post work. Also, Freelance platforms such as Upwork, are starting to show posts for chatbot development and so there will be experienced developers there too. Depending on the features and capabilities required of a chatbot, a developer may choose to use a “no code” established platform to build on top of or build from scratch. Many developers choose using a development platform because the backend infrastructure pre exists and cuts down on development time. Besides most of these platforms have advanced features where coding is optional and so a good developer can work a solution and not be limited to the platforms inbuilt features or integrations. There are bound to be local App/Web development agencies in your city that may be able to help. I am a local chatbot developer in Perth. So if you reside in Perth Western Australia feel free to catch up over a coffee to discuss deploying a chatbot for your business. thank you for reading this post. I trust it was helpful and hopefully you picked up some new information to make your time reading this worth the effort. I enjoyed writing it as the research builds on my knowledge.